When I visit Yahoo!Answers, I usually run into questions like “How can I record music from youtube”, “How do I record music from youtube”. In order to solve many questions of this kind, here I am writing this article. YouTube is a great source for new music and hard-to-find classics. If you’re like many Internet users, you probably want to play music videos and listen to songs on YouTube while you do other activities online. However, it is hard to record music from YouTube video. The post introduces how to record music from YouTube without and with devices or apps and several related tips. Part 1: How to Record Music from YouTube without Devices or Apps? Part 2: How to Record Music from YouTube with Devices or Apps? Consider that if you only have a computer running either Mac operating system or Windows operating system, how can you record music from YouTube without the additional help of devices or apps? Well, if you are using Mac OS, just open sound recorder by clicking the Apple menu and select Control Panels; select Monitors & Sound, and click the Sound icon. Here I am taking Windows 7 OS as an example to show you how to record music from YouTube with sound recorder. Open Sound Recorder by clicking the Start button. In the search box, type Sound Recorder, and then, in the list of results, click Sound Recorder. Play the music or radio you want to capture, and click start recording. Note: Make sure you have audio input devices like Microphone. This method is absolutely free but you have to play with speaker and use microphone, and it’s very difficult to control the quality of the audio you capture. 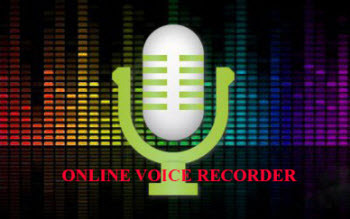 Recording music from YouTube with online voice recorder is one of the most popular ways. It allows you to create an audio recording directly from a browser by using your microphone. The recording is produced locally on your computer, and you can record as many times as you need. The recording process is quite simple. You need only give the recorder permission to access your microphone, then you can play and record music from YouTube. If you are looking for a free online voice recorder, you can try SpeakPipe, Vocaroo, Online Voice Recorder , Record Mp3 Online , Voice Spice Recorder, etc. Same as method of sound recorder, this method is free but you have to play with speaker and use microphone, and it’s very difficult to control the quality of the audio you capture. So we have to look for other solutions of recording music from YouTube. Cellphone is without doubt the most common device with recording ability. The following video will take iPhone as an example to show how to record music from YouTube with voice memos from computer speaker. Note: For better audio quality, you have to put your iPhone near the speaker. Of course you can get professional recording devices for your iPhone. 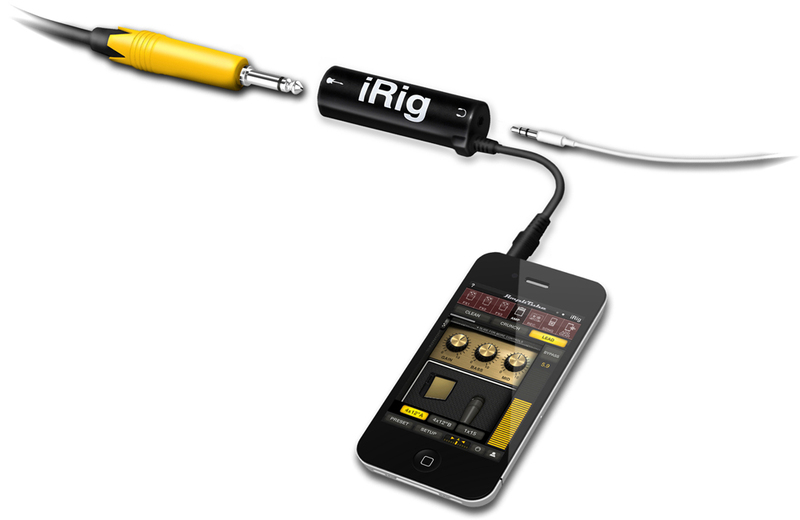 iRig can be used with any app that is capable of using a microphone to process or record online audio from your iPhone, iPad, or iPod. However an iRig Mic costs about $60, if you are not a fan of recording sound with Devices, you don’t need to buy one. Different from many methods, professional online audio recorder doesn’t need any extra devices like outside speaker or microphone. Its built-in microphone is free from the noise outside, thus improving the quality of the recordings. What’s more, professional online audio recorder can also add music tags like artist, album, album artwork, song name, and son on to recordings. 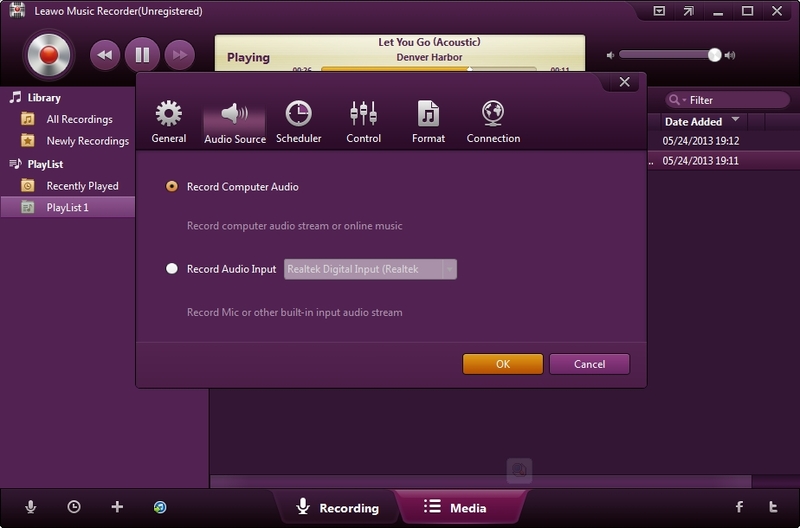 Just launch the software and click the “Record” button before playing audio, and it will automatically record the audio you are playing. Users can pause or resume capturing process anytime. The following will take the best professional online audio recorder – Leawo Music Recorder as an example to show how to record music from YouTube with professional online audio recorder. Step 1.Click the “Audio Source” icon on the main interface to set audio source firstly. To record online YouTube Music, select “Record Computer Audio” option. Step 2. Click the red “Start” button to let this Music Recorder work. And then play YouTube music that you want to record. It should be born in mind that you should first let this music recording software start recording and then play your source audio on YouTube. Step 3. 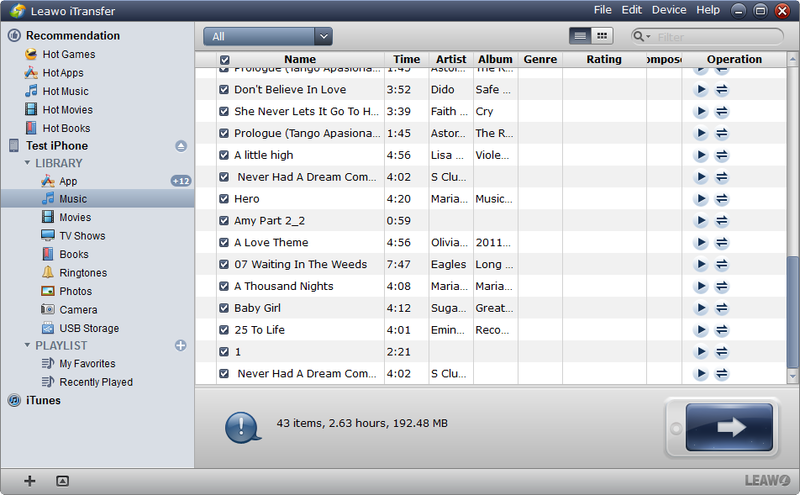 In “Media > Library” tab, you can see all your recordings. 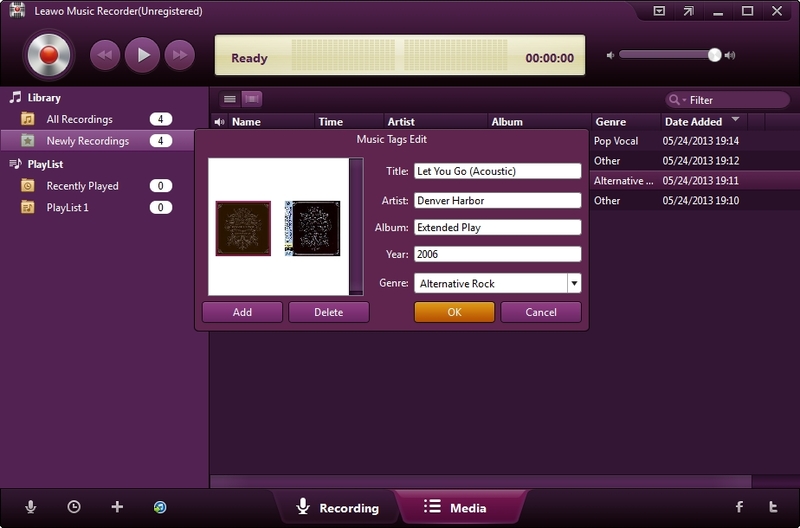 Select a recording and right click, then choose “Edit Music Tags” to manually edit music tags. In addition to the world-class Leawo Music Recorder, there are many other professional music recorders. 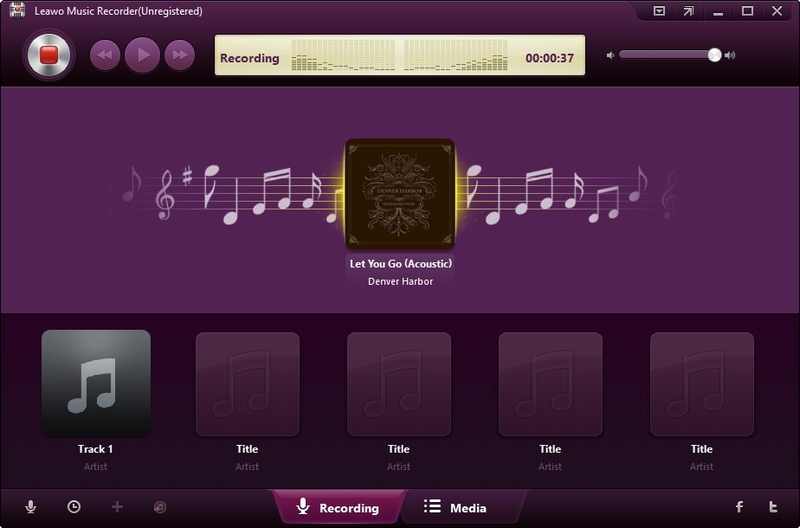 Aimersoft Music Recorder is one of music recording programs worth considering. Like Leawo Music Recorder, Aimersoft Music Recorder can play the part of a YouTube music recorder to record YouTube music. How to record music off YouTube with Aimersoft Music Recorder? 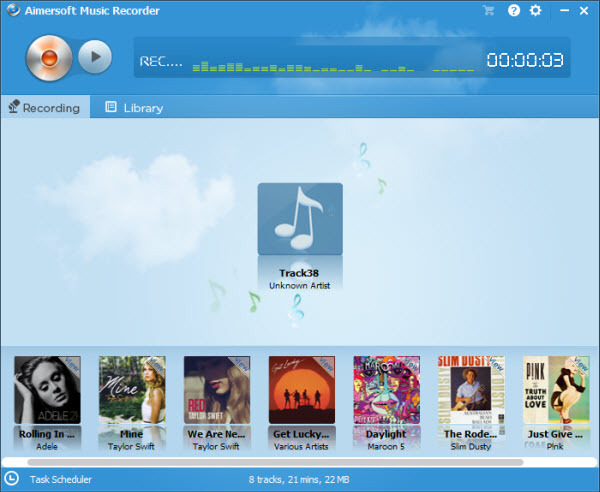 Download and install Aimersoft Music Recorder in your computer. Now follow the steps below to start to record music off YouTube. Step 1. 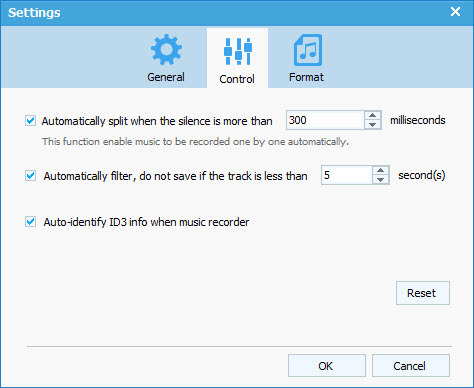 Run Aimersoft Music Recorder, click the Settings button on top of the window and choose your target output audio format (here M4A and MP3 are available for your choice). 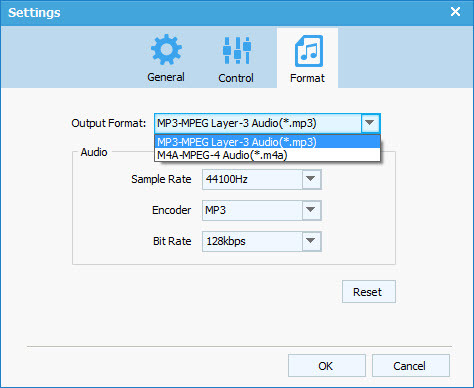 You can customize the audio sample rate, encoder and bit rate as you like. Step 2. On the setting panel, switch to “Control” button to set the recording control preference, which let you record songs one by one. It should be born in mind that you should first let this music recording software start recording and then play your source audio on YouTube. Step 3. Get back to the main interface on the YouTube music recorder and click the Record button to get ready for the recording process. Now just search for the music you want to record on YouTube and play it as usual. The audio recorder will begin recording YouTube music immediately. As we can see from the above table chart, Leawo Music Recorder and Aimersoft Music Recorder are having almost the same features in recording audio files, but Leawo Music Recorder beats Aimersoft Music Recorder in price, saving users $9. For users with limited budget, it is highly recommended to use Leawo Music Recorder. After recording music from YouTube with iPhone only, it’s really annoying that we can’t transfer the audio directly to computer to backup or share with friends. Due to iTunes restriction, we aren’t allowed to transfer files from iPhone to computer directly, and transferring iPhone voice memos to computer is no exception. Don’t worry, here is a tip. The most convenient way to transfer iPhone voice memos to computer is using a third party program. There are many related applications. In order to save your time to test one by one, here I sincerely recommend Leawo iTransfer. Download and install Leawo iTransfer before you transfer iPhone recorded music to computer. 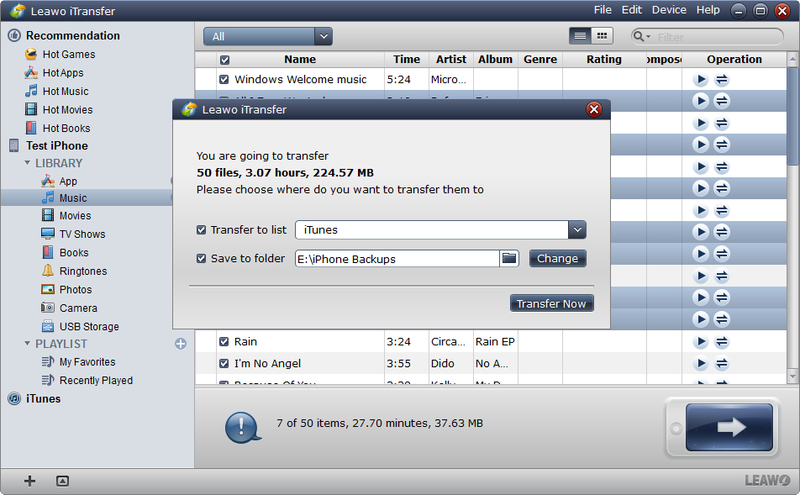 Note: Leawo iPhone Transfer only works with iTunes installed on your PC. Step 1. Run Leawo iTransfer, and connect iPhone to computer with the USB cable. The software will automatically detect the libraries of your iPhone and show them in the left sidebar. 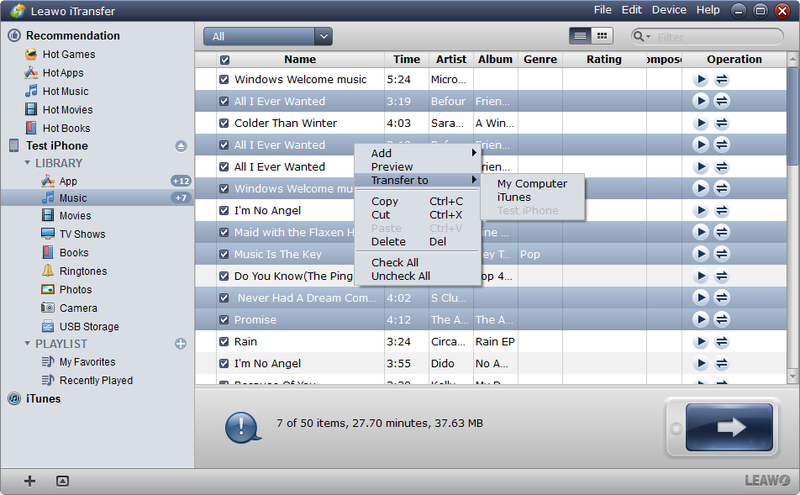 Choose the “Music” library, and then the contents will be shown in the right part of the window. Step 2. Click the transfer button at the right bottom of the window to transfer all the songs to your computer. Or hold the “Ctrl” key and click to choose songs, and then right-click the selected files and choose “Transfer to > My Computer”. Step 3. Check “Save to Folder” in the pop-up dialog and click “Change” to choose a folder on your computer to save the music files, and then click “Transfer Now” at the right bottom of the dialog to start transferring music from iPhone to computer. When the transfer is finished, you will get the files in the target folder. See? It is very convenient to transfer iPhone recorded music to computer with the help of Leawo iTansfer. Related Tips #2: How to record high-quality music without professional music recorder? If you don’t have a professional music recorder, but want to record high-quality music, how can you achieve the aim? When you are using internal sound recorder of computer or a online voice recorder to record music, microphone equipment and the outside environment greatly influence the quality of recorded music. Therefore you should pay more attention on your selection of microphone and recording place. Here are several tips you can follow. Invest in a good quality microphone. Choose a recording place that can block as much of the noise as possible. When those two conditions are fully met, you are much more likely able to record high-quality music without professional music recorder.